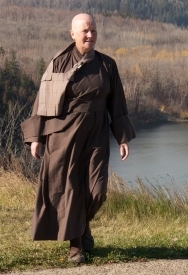 One of the senior monks of our Order in the UK, Rev. Master Saido of Telford Buddhist Priory, was recently interviewed on BBC Radio Shropshire. Through the ‘magic’ of the internet and Rev. Saido’s web masterly skills he has posted the talk on the priory web site. For those with a fast broadband connection there is an mp3 file to download and for dial up connections you can ‘stream’ the talk. OK, that means you will listen through your computer. I don’t pretend to understand much more than that. I listened to most of the talk last evening. It comprises of Rev. Saido talking on Buddhist practice and what brought him to it and also a long section where the congregation talk about their understanding of practice. The whole program is accessible to non Buddhists and puts what we do into a context that people interested in trying us for size can relate to. Time is running out. Too bad. I wanted to post a photo of the space where the priory ‘wheelie bin’ (garbage can) was before it got stolen early one morning. I was staying at the priory at the time of the theft and saw the bin disappearing up the road. They say there is a market for these bins in Ireland. Amazing what people need to steal! Maybe you heard about the 3-ton Henry Moore scuplture being lifted last weekend onto a (stolen) flat-bed truck, and last seen disappearing into Essex. Errr, not sure how the above comment found it’s way in. Nothing and nobody connected with me.